A range of third-party accessories will be available for the iPad 2, including cases, stands, docks, cables and screen protectors. But many of these will take a few weeks to hit the shelves. In the meantime, Apple will have a number of official iPad 2 accessories which will be sold through Apple Stores and selected retailers from tomorrow. 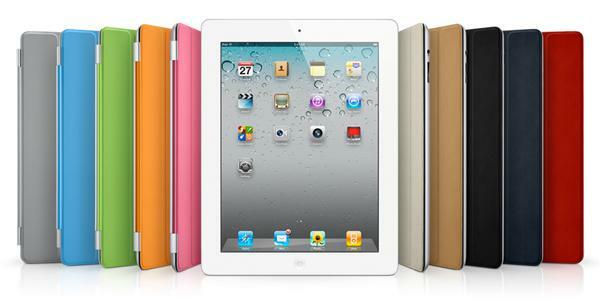 Apple has released a new cover for the iPad 2, dubbed the 'Smart Cover'. Described by Steve Jobs as "not a case," the Smart Cover has a magnetic flap that clips onto the side of the iPad 2, and automatically wakes and puts the iPad 2 to sleep depending on whether it is open or closed. 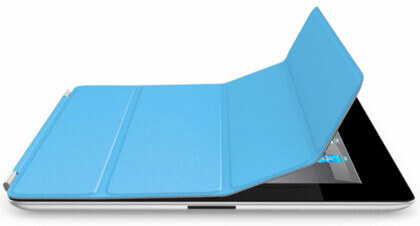 The Smart Cover also folds into a stand and comes in 10 colours — five in Italian leather, and five in polyurethane. Leather Smart Covers are available in black, cream, navy, tan, and red, while the polyurethane Smart Cover comes in blue, green, grey, orange and pink colours. The iPad 2's 'Smart Cover' has a magnetic flap that clips onto the side of the iPad 2. It automatically wakes and puts the iPad 2 to sleep depending on whether it is open or closed. The iPad 2 is capable of 1080p Full HD HDMI output, but only if you purchase the optional Apple Digital AV Adapter that plugs into the standard Apple dock connector. The Apple Digital AV Adapter mirrors what you see on your iPad on your TV or HDMI-equipped monitor, and comes with a second built-in dock connector allowing you to charge the iPad 2 at the same time. One of the chief criticisms of the iPad 2, like the original iPad, is its lack of a USB port or a memory card reader for uploading photos. Apple's answer is the camera connection kit — it's available in USB or SD card models and means you don't have to connect the iPad 2 to your PC to upload photos. It also works with the original iPad. The iPad 2 may be awkward to hold due to its size and if you have limited desk space at home, a dock could be ideal to save some space. The Apple iPad 2 dock has a rear dock connector for easy connection to a desktop or notebook computer, and also features an audio line-out port. The iPad 2 power adapter lets you charge your iPad through an electrical outlet and comes with a longer cord. Of course, it also works with the original iPad. This cable allows users to connect an iPad 2 to an older projector or monitor without a HDMI input and display content such as photos, videos and apps on a larger screen. Unfortunately, this accessory only outputs images and video, not sound. It also works with the original iPad.